As blogged here, Kevin Carter’s Landscape/Portrait gives participants the opportunity to post their own video portraits alongside ‘demographic portrait’ texts that are derived from national census data for every UK postcode and used to inform policy and planning decisions. Each video portrait also features a facility for registered users to respond to other participants’ videos. Looking for a way to occupy and animate these comments boxes, or at least those that accompany portraits made during the Bournemouth and Poole phase of the project, I’ve sketched two ‘commentbot’ simulations: Daisy Botanist and Postal Coder. I wanted these sketches to also lightly reflect Simon Yuill’s A New Kind of Commons project (blogged here) by linking out to historical information about the changing uses of the commons in the Bournemouth area and online resources about types of plants found on Turbary or Kinson Commons. Unlike ‘real’ commentbots that (with apologies for the following demonstration of my non-geekness) send out spam comments in order to plant phishing or malware links into blogs, chat spaces on social networks etc., the messages from Daisy Botanist and Postal Coder are tailored to each location and each video portrait. Furthermore they are benign and the links they offer are genuine (now that these comments have been posted, HTML-writing capability within the comments boxes has been disabled). Daisy Botanist and Postal Coder are each little more than a log-in and a series of simple functions. I wanted to see if it was possible to create comment generators that could contrast aspects of CACI‘s census-derived but oddly general, dated and cliché-ridden demographic portraits with the corresponding ways that Landscape/Portrait participants from these same postcode areas actually describe themselves. As would appear to be the case with the CACI portraits, these sketches are generated by a process that is at least partly-automated and then edited. I took a cue from Robert Frank and Alfred Leslie’s 1959 film Pull My Daisy, with its improvised narration by Jack Kerouac, then simplified it. I wanted an excuse to watch all the portraits and a way to sample-and/or-write on the fly, in real time. You say [self-description sample], they say [CACI description sample]: they’re pulling our [name of local flora + link]. The Postal Coder comments are designed specifically to contrast the types of very real personal or community-based creativity that people discuss in their own video portraits with the bizzarre and affectless CACI portraits in which people are reduced to an agencyless classification or, most crassly, a ‘type’, according to certain extrapolated consumption habits. From [19th century fieldname + link] to [current postal shortcode] and [participant’s chosen place], still [type of creativity described]. From Netherway to BH11 or the gymnasium, still meeting people out in the fresh air. 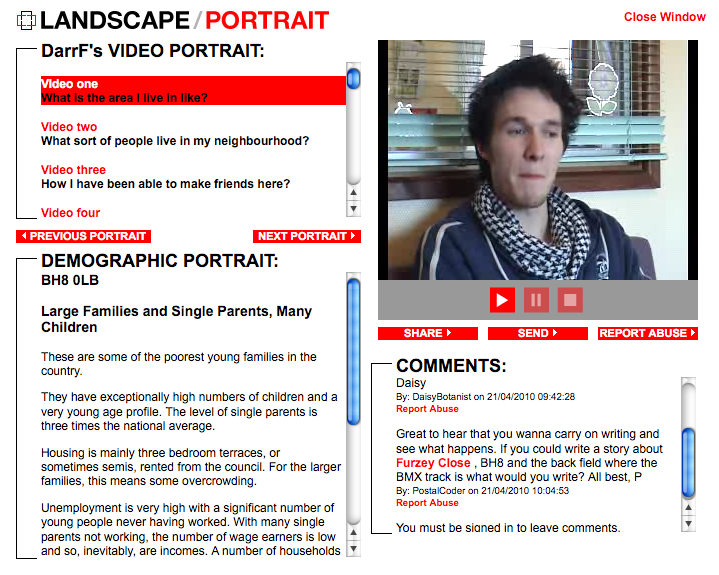 This screengrab shows how the video portraits appear on the Landscape/Portrait site. At the bottom left of the window is the demographic portrait for the participant’s full postcode, as generated by CACI’s ACORN programme, while at the bottom right is the comments box, in this case showing a comment by the Postal Coder simulation. Each simulation draws on an additional limited pallet of greetings (e.g. ‘Hi [username]’), chat clichés such as :-) and LOL, and sign-offs (e.g. ‘All best, P’), as well as variations, compressions and improvisations of other kinds. There are also one or two instances where an exchange between Daisy Botanist and Postal Coder suggested itself, but in spite of that this is not a story and neither ‘Daisy’ nor ‘P’ are characters; although in another context they might be. Here they are simply sketches; commentbot simulations. I should add that even though this has been a more or less automated process, it has also offered the chance to respond conversationally to some very interesting video portraits that I have greatly enjoyed watching. The resulting comments are therefore posted on the Landscape/Portrait site with thanks to all the various participants.